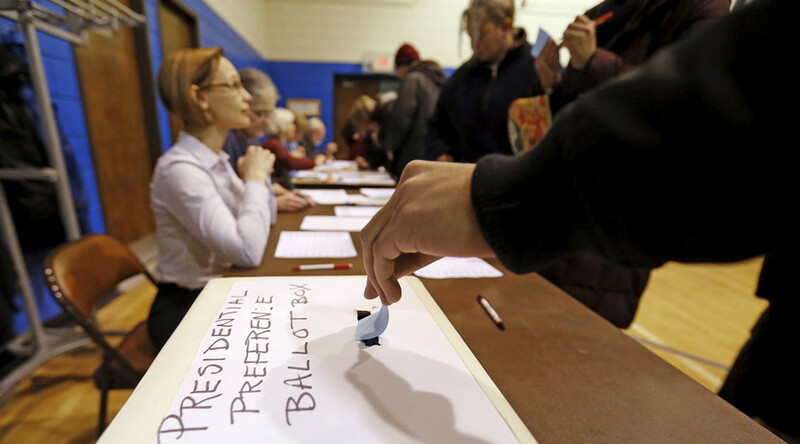 Voters in Kansas, Kentucky, Louisiana, Maine and Nebraska will go to their respective caucuses or primary this weekend to decide on presidential nominees for the Republican and Democratic parties. The stakes are high with 155 Democratic delegates and 178 Republican delegates up for grabs. There is a Democratic caucus in Nebraska on Saturday, but no Republican one (their turn comes on May 10 in the form of a primary). Senator Bernie Sanders (Vermont) has spent more than double Hillary Clinton's campaign has spent on TV ads in the state’s two biggest markets. There has been no publicized polling to predict the outcome of the caucus, but both campaigns have expressed optimism. "Personally, I think it's way too close to call," Vince Powers, chairman of the state Democratic Party told the Associated Press. "The unknown factor is that Bernie Sanders is targeting new voters. Approximately 2,000 new Democratic voters have registered in Douglas County since February 1. I would think the majority of them are Sanders supporters." Douglas county, where Omaha is located, is the state's most populous county. Sanders attended a standing-room-only rally in Lincoln on Thursday, and Clinton came to Omaha in December. Former President Bill Clinton made campaign appearances before the caucus. Nebraska, while tending to be more conservative since the 1990s was one of the states where Obama led by a two to one margin against Clinton in the 2008 election, a hard lesson she learned about not focusing on the smaller states. Democratic front-runner, Hillary Clinton is pushing to win the Louisiana primary, a southern state with a diverse electorate. A Magellan Strategies Louisiana poll taken with registered Democrats on Super Tuesday night showed a major blowout for Hillary Clinton holding a 62-14 advantage over Bernie Sanders, with 25 percent undecided. Senator Bernie Sanders (Vermont) has vowed to fight for the presidential nomination until the Democratic convention but the results from Super Tuesday shows him lagging behind in pledged delegates, particularly after Clinton’s landslide wins in the South, where she secured 80 percent of the African-American vote. African American voters account for a quarter of Democratic voters, and a majority of voters in the southern states. Sanders’ lacks a strong showing among black voters, and so far he has no southern state wins. Donald Trump is enjoying a sizable lead on the eve of Louisiana's GOP primary, according the New Orleans Times Picayune. The University of New Orleans found on Wednesday that 38 percent of likely Republican voters wanted to see him win the party nomination in Louisiana. His nearest rival, Cruz, scored 26 percent of the vote and Rubio scored just 11 percent. Ohio Gov. John Kasich scrapped up 5 percent. Rubio campaign also quietly announced they had canceled his rally in Louisiana. Few candidates have made the trek to Maine. Last Friday, Maine Governor Paul LePage endorsed Trump. The Boston Globe reported Maine political strategists view a Trump win in the state as inevitable given his momentum coming out of Super Tuesday and the LePage endorsement. Only Republican voters will be out for the caucus on Saturday. A poll out of WKU showed Donald Trump leading the Republican field in Kentucky with a 13 percent lead over his closest opponent, according to the ABC Tristate. Kentucky University’s poll showed Donald Trump with 35 percent, Marco Rubio 22 percent and Ted Cruz with 15 percent. Again, the Rubio campaign canceled his rally in Kentucky. Republican presidential candidates Senator Ted Cruz (Texas) and Donald Trump are scheduled to campaign in Wichita, Kansas on Saturday morning for caucus votes. There are 40 delegates at stake. Trump will hold a rally in the morning and will then head off to Florida. Cruz will speak to the caucus in the morning. Senator Marco Rubio (Florida) was campaigning in Kansas on Friday ahead of the caucus. He affirmed that he would support Donald Trump in November if the billionaire businessman wins the GOP presidential nomination. He told a few hundred supporters at Topeka airport, Trump's nomination would "split the Republican Party" and "end the... conservative movement," according to AP. Asked later how he could reconcile those statements with a pledge to back Trump as nominee, Rubio told reporters, "Because that's how bad Hillary Clinton is." Clinton and Trump lead slightly in the polls, but the Wichita Eagle reported that about 40 percent of voters said they were undecided. Clinton was in Detroit, Michigan on Friday, ahead of the state's primary on Tuesday where 148 delegates are at stake. Speaking before a crowd at Detroit Manufacturing Systems, she said the nation needs a "new bargain" to create better-paying jobs, pointing to the state as an example of manufacturing success, according to the Associate Press. Clinton’s campaign manager, Robby Mook, sent out a memo on Wednesday predicting they may lose the caucus states this weekend. “Although we continue to fight for every vote, Senator Sanders has clear advantages and is investing heavily in two upcoming caucuses (Nebraska and Kansas),” wrote Mook, according to the Huffington Post. Senator Bernie Sanders spoke at Southern Illinois University in Edwardsville on Friday where students packed a 4,000 seat campus basketball arena, including a gym floor and outer hallways. His call for free higher education is resonating with students in Illinois, where they are facing deep cuts in state funding. Sanders touched on familiar campaign themes, calling for campaign finance reform, marijuana decriminalization and increased corporate taxes, according to AP. The Sanders team agreed that it holds the upper hand in the weekend’s caucuses, according to the Huffington Post. Both candidates are hoping to win Michigan in the primary on Tuesday, March 8, although polls show Clinton with a significant lead in the state. Both democratic candidates are looking ahead to delegate-rich March 15, when Florida, Illinois, Missouri, North Carolina and Ohio will be holding their primaries.